Minneapolis is facing a growing housing crisis. Every day, more working people and people of color are displaced by skyrocketing rents. Big developers are building condos all over Ward 3, where Ginger Jentzen is running for City Council, yet these new high-end units are affordable only to a few. A recent study found that there is not one neighborhood in the city affordable to a median income black family. Meanwhile, an out-of-touch political establishment in Minneapolis City Hall carries out profit-driven housing policies, where developers get rich and working people get left behind. Housing has become a central theme in the election this year, and developers are spending big and fighting to keep their firm grip over city politics. It is no coincidence that Ginger is the only Ward 3 candidate who refuses to accept money from developers and also the only candidate who supports the kind of bold policies needed to push back against rising housing costs. Minneapolis needs rent control. While no silver bullet, rent control is one of the most effective ways to stop skyrocketing rents. Our campaign is also fighting for stronger protections for renters and full enforcement of existing tenant rights. Tenants should have six months advance notice of a major rent increase, rather than the 30 days currently legally required. Security deposits and move-in fees should be capped at no more than one month’s rent. Notorious slumlords like Stephen Frenz exploit the lack of affordable housing and renter protections, raking in massive profits with substandard housing by banking on the fact that tenants can’t find an alternative. The myth perpetuated by big developers, who typically dominate local elections, is that rent control reduces the quality and quantity of available housing. Unfortunately each of Ginger’s opponents in Ward 3 have echoed these scare tactics, with DFL establishment candidate Steve Fletcher instead advocating to “incentivize landlords.” But incentivizing landlords and developers is not working – it is precisely these “let the market decide” policies which are relentlessly driving up housing costs alongside real estate profits. The city establishment claims that the key to housing affordability is to give for-profit big developers the tax breaks and loopholes to build more. Yet of the 5,600 rental units planned for the metro area in 2016, only 1/10 were slated to be affordable. Status quo politics have failed working people in Minneapolis. We must tax developers and the rich, not working-class people, to fund affordable housing. Minneapolis should make developers pay “linkage fees” to fund high quality, city-owned affordable housing. Our campaign points to the work of Councilmember Kshama Sawant in Seattle, who, in coalition with several grassroots organizations, helped win a tax on the rich that amounts to $140 million annually. The struggle for affordable housing in Minneapolis needs a voice in City Hall. We need elected officials who will use their elected office to fight unambiguously for working people, rather than to “make life easier for developers,” as Steve Fletcher has pledged to do. The establishment says that taxing the rich can’t be done. Yet they also said that a $15 minimum wage was illegal, too high, and impossible. Ginger Jentzen and Socialist Alternative built a movement that took on some of the most powerful corporations in the state, and we won. 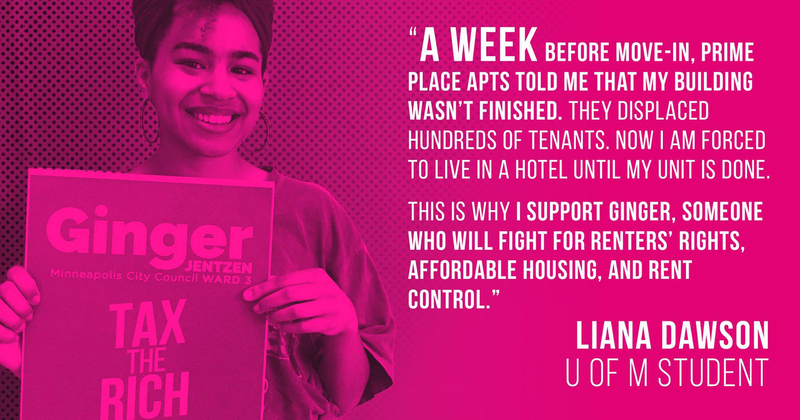 We can do the same in the fight for affordable housing. Previous articleSpain/Catalonia: Historic General Strike in Catalonia. Out With the PP Government!